All 50 sites in Arches' campground are usually reserved in advance during the busy season (March through October). 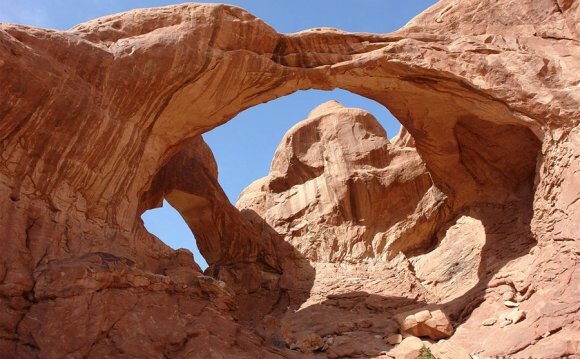 For a complete list of campgrounds outside Arches, visit www.discovermoab.com. Devils Garden Campground is located 18 miles from the park entrance and is open year-round. There are 50 individual sites which are $25 per night and accommodate up to 10 people, as well as two sites for groups of 11 or more. Facilities include potable water, picnic tables, grills, and both pit-style and flush toilets. There are no showers or RV dump/fill stations. Phone and online reservations for both group and individual sites must be made through Reservations are not accepted by the park, and the park does not maintain information about site availability. If you have not reserved a site prior to arrival at the park during the busy season, plan on utilizing other camping options in the Moab area.